Walking the outer suburbs, this time somewhere a little closer to the city, this time somewhere a little more affluent. 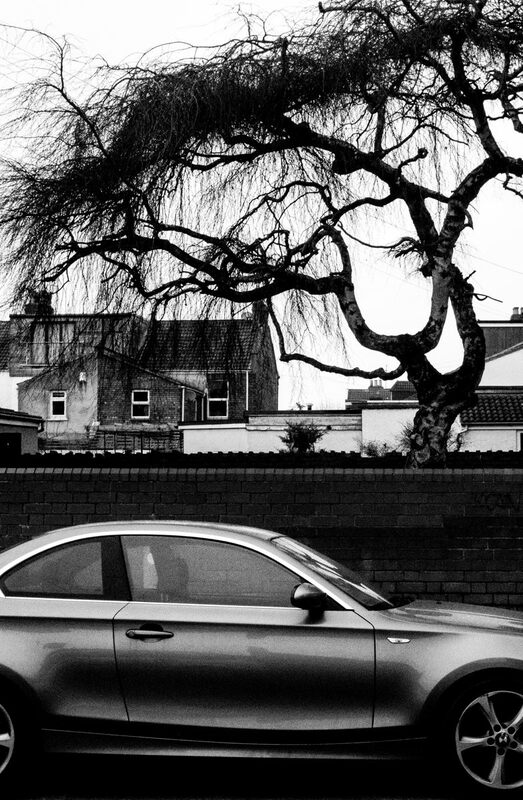 Lots of cars like this, but the tree caught my eye – something almost Oriental here, something natural and graceful overlooking the sleek, manufactured metal – something natural completely at ease alongside the machine’s designer styling. There is an earlier parked car image here: 1 . The first image in the Outer Suburbs series, with context, is here: 1 . Subsequent images are here: 2 3 4 5 6 7 8 9 10 11 12 13 14 15 16 17 18 19 20 21 22 23 24 25 26 27 28 29 30 31 32 33 34 35 36 37 38 39 40 41 42 43 44 45 46 47 48 49 50 51 52 53 54 53a 55 56 57 58 59 60 61 62 63 64 65 66 67 68 69 70 71 72 73 74 75 76 77 78 79 80 81 82 83 84 85 86 87 88 89 90 91 92 93 94 95 . Each will open in a separate window. Technique: TG-5 at 46mm (equiv); 1250 ISO; Lightroom, using the Camera Monotone film simulation; south Bristol; 28 Feb 2019. 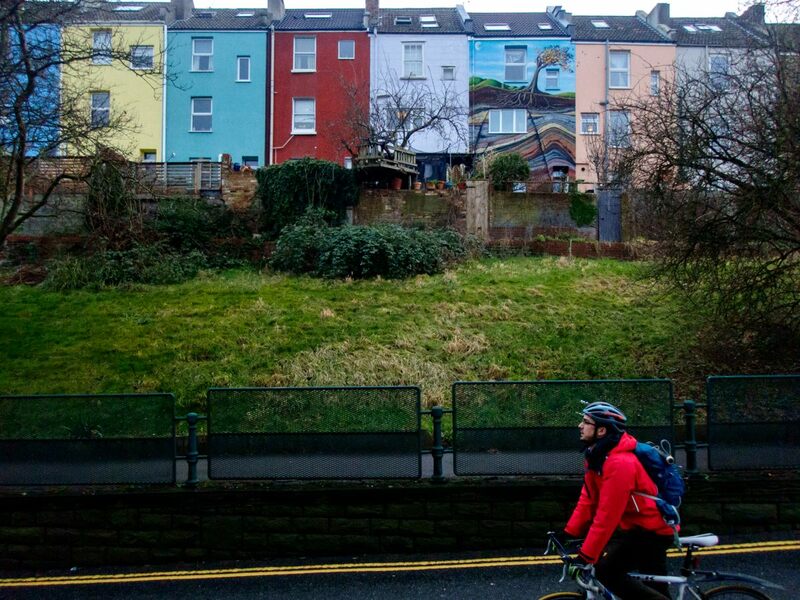 Going to work, past Bristol’s brightly coloured (and decorated) houses. You can see a summary of the Going to Work series here . Earlier images from this series can be found here: 1, 2, 3, 4, 5, 6, 7, 8, 9, 10, 11, 12, 13, 14, 15, 16, 17, 18, 19, 20, 21, 22, 23, 24, 25, 26, 27, 28, 29, 30, 31, 32, 33 34 35 36 37 38 39 40 41 42 43 44 45 46 47 48 49 50 51 52 53 54 55 56 57 58 59 60 61 62 63 64 65 66 67 68 69 70 71 72 73 74 75 76 77 78 79 80 81 82 83 84 85 86 87 88 89 90 . Each will open in a separate window. Click onto the image to open a larger version in a separate window, and click onto that image to enlarge it further – recommended. Technique: TG-5 at 25mm (equiv); 800 ISO; Lightroom, using the Camera Vivid film simulation; St Luke’s Road, south Bristol; 29 Jan 2019. 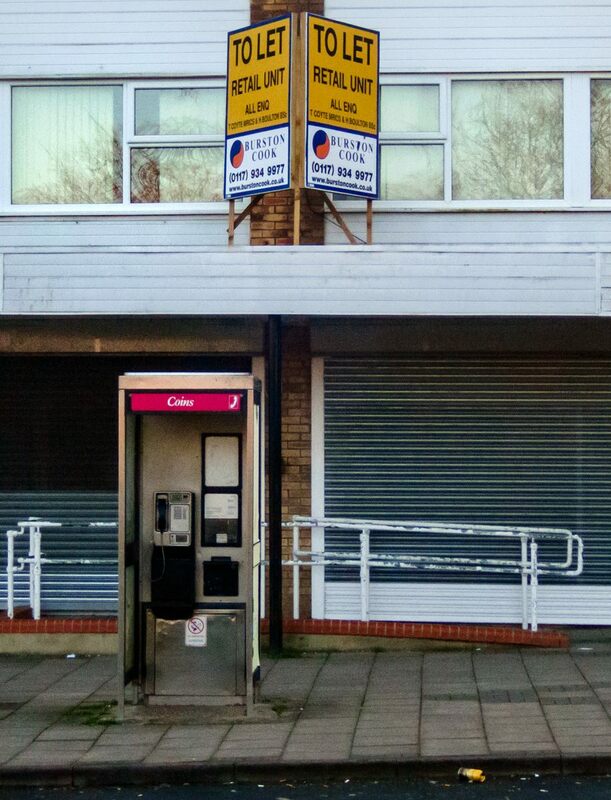 Shop that has recently closed: a purely basic, purely functional retailscape, with little to lift the soul save perhaps the facility for phoning someone else who is somewhere else. The first image in the Outer Suburbs series, with context, is here: 1 . Subsequent images are here: 2 3 4 5 6 7 8 9 10 11 12 13 14 15 16 17 18 19 20 21 22 23 24 25 26 27 28 29 30 31 32 33 34 35 36 37 38 39 40 41 42 43 44 45 46 47 48 49 50 51 52 53 54 53a 55 56 57 58 59 60 61 62 63 64 65 66 67 68 69 70 71 72 73 74 75 76 77 78 . Each will open in a separate window. Technique: TG-5 at 57mm (equiv); 800 ISO; Lightroom, using the Camera Vivid film simulation; south Bristol; 23 Feb 2019. Sunlight and shadows on the Georgian frontage at the bottom of Lodge Street, in Bristol city centre; 20 Aug 2013. Technique: D800 with 70-300 Nikkor at 300mm; 400 ISO; converted to mono with Silver Efex Pro 2, starting at the Cool Tones 1 preset, but abandoning bluish toning later on. Three things to talk about today. First, Bristol has serious traffic congestion, and the new Metrobuses are aimed at helping to ease this. These are new and very modern, double decker buses with long routes right across the city, and they are cashless, which means that you can only buy tickets online, or via your mobile phone, etc etc – you can’t actually put your hand in your pocket and pull out the filthy lucre. This is aimed at having these buses hanging around less at their stops while the drivers give each passenger their ticket and change, and so speeding up the journeys – something which is also helped by bus only lanes on some main roads. 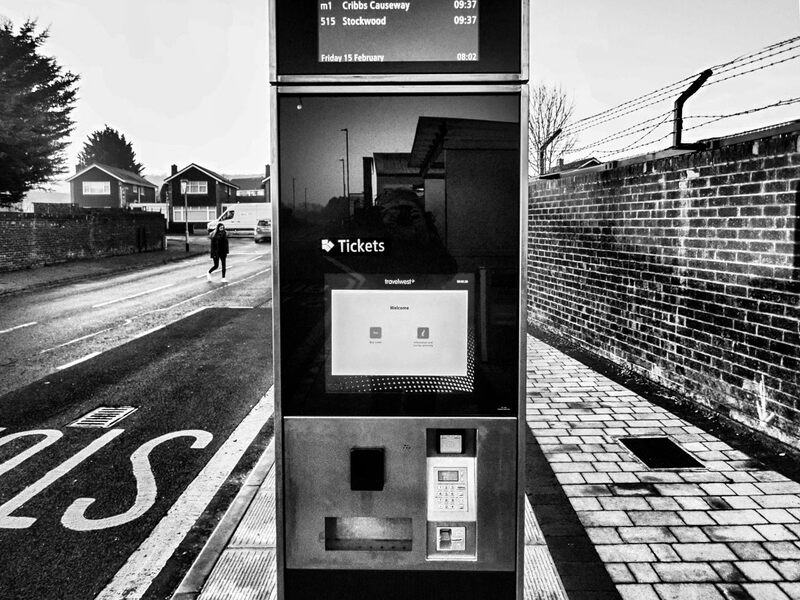 And because payment is digital, each bus stop must have one of these illuminated columns – looking rather like something out of the Stanley Kubrick’s film 2001: A Space Odyssey – from which you can buy tickets via debit/credit cards; and where the buses are satellite tracked, so that accurate arrival times plus other info is also available. Click onto the image to open a larger version in a separate window, and click onto that image to enlarge it further – definitely recommended. Technique: secondly, this image comes from a source I haven’t used before, its derived from using the TG-5’s RAW Data Edit facility to process a RAW image in-camera. This uses the TG-5’s large array of ART BKT filters, or art filters – this one being the Dramatic Tone II filter. I like the effect, but have to say that this in-camera RAW processing is far less intuitive and useful than that found on Fujifilm’s X-T2 mirrorless camera, where it is really is a significant creative tool. Still, yet another aspect of the TG-5, a camera which I’m increasingly impressed with. Technique: another aspect of this photo is the deep depth of focus (= depth of field), which results from the TG-5’s very small sensor – for the most part, this is a camera for those liking front to back sharpness. This was taken at f2, where depths of field on larger sensors are very small – the TG-5 does of course have smaller apertures, up to f11 I think, but I read somewhere that these smaller apertures do NOT give increased depth of focus on the TG-5, which is an interesting phenomenon I’ve not come across before. The first image in the Outer Suburbs series, with context, is here: 1 . Subsequent images are here: 2 3 4 5 6 7 8 9 10 11 12 13 14 15 16 17 18 19 20 21 22 23 24 25 26 27 28 29 30 31 32 33 34 35 36 37 38 39 40 41 42 43 44 45 46 47 48 49 50 51 52 53 54 53a 55 56 57 58 59 60 61 62 63 64 65 66 67 68 69 70 71 72 73 74 75 76 . Each will open in a separate window. Technique: TG-5 at 25mm (equiv); 320 ISO; in-camera processing of a RAW file, using the Dramatic Tone II art filter; followed by further processing of the resulting jpeg in Lightroom; south Bristol; 15 Feb 2019. Early for an appointment in the city. Early for an appointment to road test a camera as it happens. And so to roaming the streets, looking at anything and everything, taking it all in. 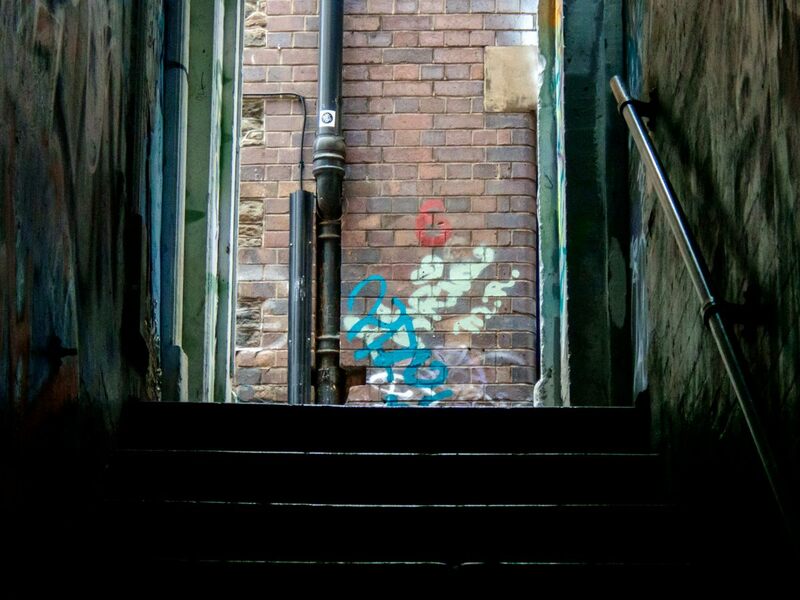 A dark entry beckoned, sombre stairs disappearing up into loneliness, silence, gloom and shadow. I found myself nervously ascending between dimly seen, decorated walls, my little camera clutched close, clutched tight as a talisman. But enlightenment, I was heading up towards light! 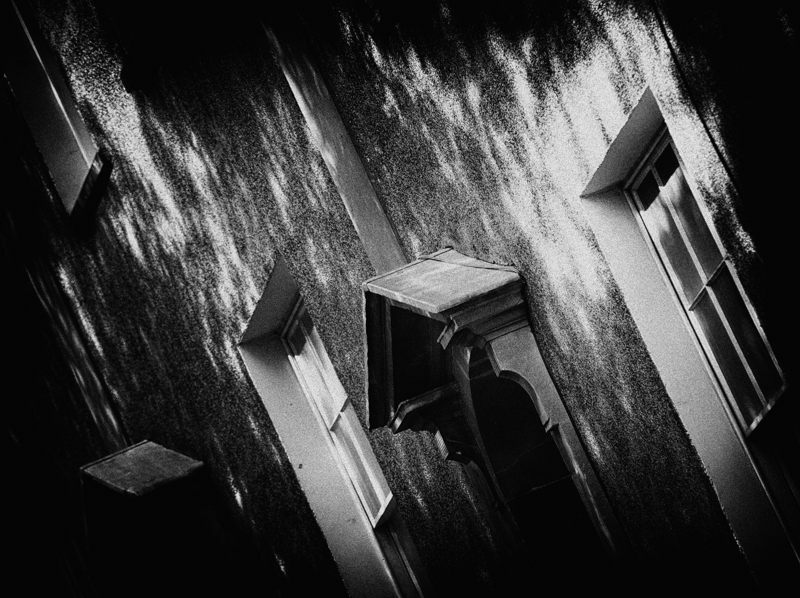 I was heading up – as it happened – towards a drainpipe. Technique: TG-5 at 100mm (equiv); 1600 ISO; Lightroom, using the Camera Vivid film simulation; St Stephen’s Street, central Bristol; 12 Feb 2019. 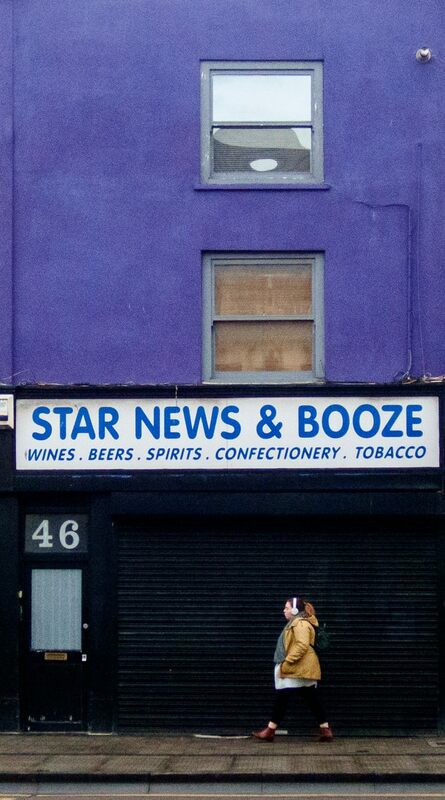 Walking to work – and Modern Life too, I suppose – booze, news, smokes and headphones >>> and a wonderfully coloured frontage that is instantly alive and real, and instantly apart from the drab conformity and aching sterility of “High Street Correctness”. Earlier images from this series can be found here: 1, 2, 3, 4, 5, 6, 7, 8, 9, 10, 11, 12, 13, 14, 15, 16, 17, 18, 19, 20, 21, 22, 23, 24, 25, 26, 27, 28, 29, 30, 31, 32, 33 34 35 36 37 38 39 40 41 42 43 44 45 46 47 48 49 50 51 52 53 54 55 56 57 58 59 60 61 62 63 64 65 66 67 68 69 70 71 72 73 74 75 76 77 78 79 80 81 82 83 84 85 86 87 88 89 . Each will open in a separate window. Technique: TG-5 at 38mm (equiv); 800 ISO; Lightroom, using the Camera Vivid film simulation; Bedminster, south Bristol; 29 Jan 2019. 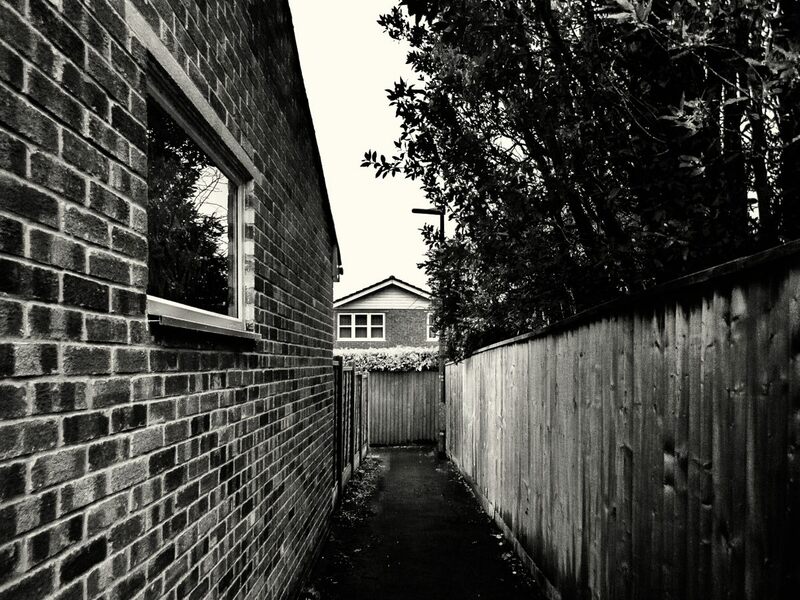 Another functional and not unattractive pathway through modern housing, and something very different from the previous one. Unusually for me, colour and mono images here – for me the black and white gets it – and I think its worth enlarging >>> click onto it to open a larger version in a separate window, and click onto that image to enlarge it yet again. 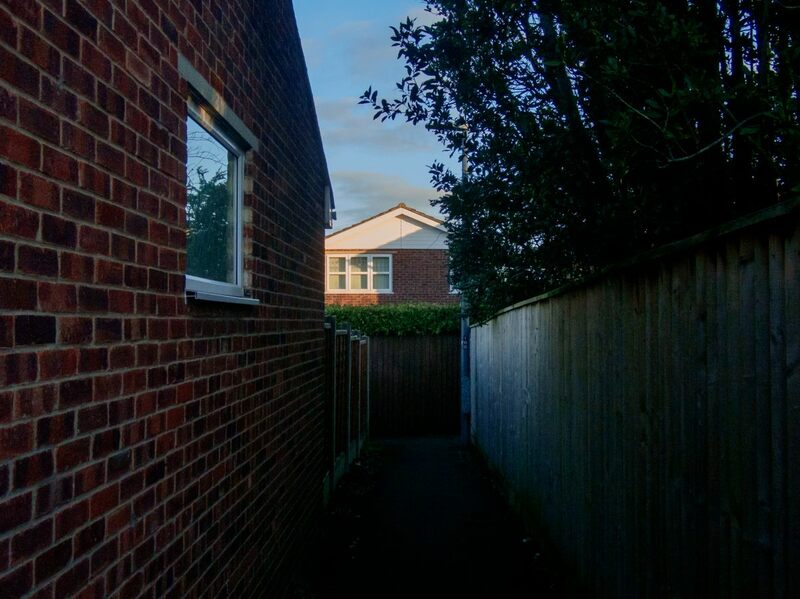 Earlier pictures of a paths through modern housing are here: 1 2 3 4 5 . Each will open in a separate window. The first image in the Outer Suburbs series, with context, is here: 1 . Subsequent images are here: 2 3 4 5 6 7 8 9 10 11 12 13 14 15 16 17 18 19 20 21 22 23 24 25 26 27 28 29 30 31 32 33 34 35 36 37 38 39 40 41 42 43 44 45 46 47 48 49 50 51 52 53 54 53a 55 56 57 58 59 60 61 62 63 64 65 66 67 68 69 70 71 . Each will open in a separate window. Technique: TG-5 at 25mm (equiv); Lightroom, using the Camera Vivid film simulation; Silver Efex Pro 2, starting at the High Contrast Orange preset and adding a light Coffee tone; south Bristol; Jan & Feb 2019. This project has been running, on and off, for sometime now – the first post (number 1, below) was in July 2016. For those not familiar with the earlier posts, this project is now in three parts. First there is the great bulk of posts in the earlier stages: numbers 1 to 86 below. This really came about for two reasons. 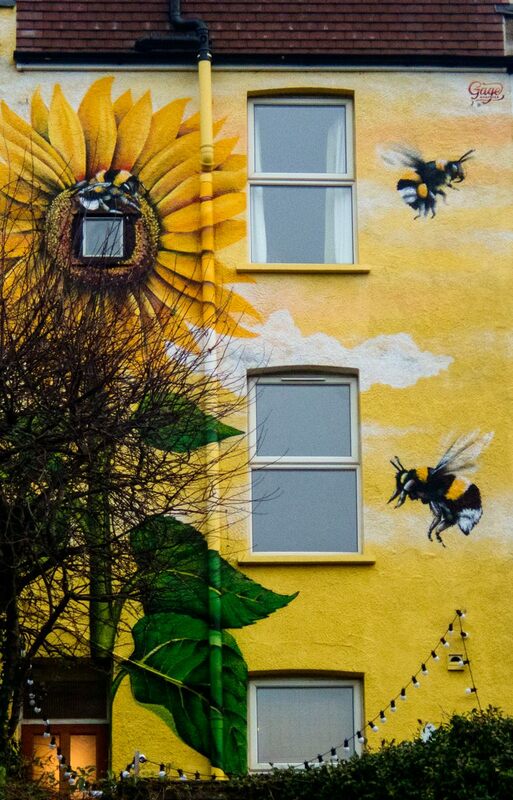 First, having retired in 2013, I became increasingly interested in the work phenomenon, and a single photographic look at Bristol’s early morning rush hour ramped this interest up to the level of a fascination for a twice daily event – a twice daily tide – that, until recently, I had been a part of. And such long, early morning visits to the city centre were considerably facilitated by the excellent, lighter and smaller Fujifilm mirrorless cameras (X-T1 and X-T2) that gave me a break from my also excellent but bigger and heavier Nikon DSLR gear. In some part I felt (and feel) that commuting and city centre working can be something of a pressurised and dehumanising experience; as I recall from two bouts of overwork and stress-related illness. And then part 2 of this project is a single picture (number 87) taken in heavy rain with the Olympus TOUGH TG-5 camera. I’d bought this camera with the aim of looking at the rush hour in atrocious weather conditions, but that aim has yet to be fulfilled – >>> the spirit is willing but the flesh is weak??? 🙂 But the TG-5 has instead proved itself very flexible and useful in the Outer Suburbs project, which makes up the bulk of my posts these days. And, last week, I found myself with the TG-5 in the morning rush hour in Bristol’s Bedminster suburb, and so to a few more images, part 3 of Going to Work, starting with post 88. But where this project will go from here – as usual – I have not the slightest idea!!! Alone on a cold, damp morning. Overcast, and going to work. Earlier images from this series can be found here: 1, 2, 3, 4, 5, 6, 7, 8, 9, 10, 11, 12, 13, 14, 15, 16, 17, 18, 19, 20, 21, 22, 23, 24, 25, 26, 27, 28, 29, 30, 31, 32, 33 34 35 36 37 38 39 40 41 42 43 44 45 46 47 48 49 50 51 52 53 54 55 56 57 58 59 60 61 62 63 64 65 66 67 68 69 70 71 72 73 74 75 76 77 78 79 80 81 82 83 84 85 86 87 88 . Each will open in a separate window. 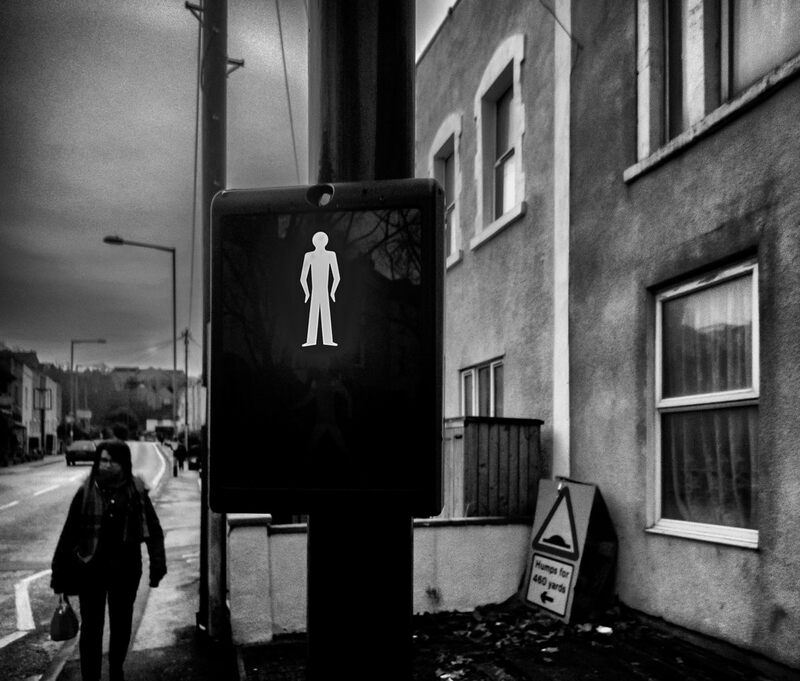 Technique: TG-5 at 25mm (equiv); 500 ISO; Lightroom, using the Camera Vivid film simulation; Silver Efex Pro 2, starting at the Full Contrast and Structure preset; St Luke’s Road, south Bristol; 29 Jan 2019.